This event is for New Post event. Since i use it from the first time Maximum Words rules does not works. 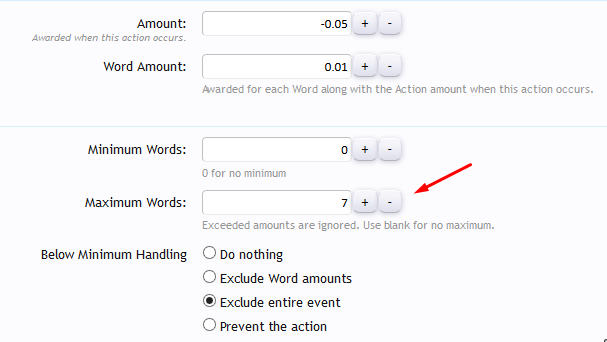 I have set Maximum Words amount to 7 but when i make new post with many words then i got wrong credit value. Please fill 0 to Word amount option. I hope you read options' small caption to get understanding on this event. I want to charge user for too short post, and award them for long post. then he will be charge: - 0.05 + 0.01 * 7 words = 0.02. Why only 7 words? Because Exceeded amounts (7) are ignored. 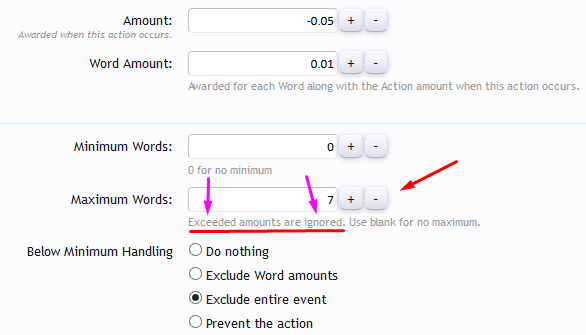 But in fact, if a user post 1000 words or more your add on still count all the words without limited to 7 words. So, whats wrong with my settings? Do not ask me to change my settings. Just explain what is the correct calculation for this settings and for the scenario above. Which credits version are you using? Hi @joey_tbf i am using version 1.74. It is the last stable version. hello @Brivium are you there? Fixed in Beta? lol... As you call it beta then it means not ready to use, or not fixed yet. NOTES: A beta release is intended for testing only, and is not recommended for production use. It contains known bugs and incomplete functionality. There is no way to downgrade a Credits Premium installation so if you upgrade your live installation, there's no going back. If you choose to run beta software, it is your responsibility to ensure that you make a backup of your database.